If you have inflammatory bowel disease (IBD), or you love someone who does, you don’t need an awareness day to tell you the impact it has on your daily life. People living with Crohn’s disease or ulcerative colitis and their caregivers already have a vast education on IBD that can only be gained through experience. World IBD Day isn’t really for you. World IBD Day is for everyone else—people you don’t know as well as people you do know—who don’t have the intimate knowledge of the challenges that IBD brings. Are There People Who Don’t Know About IBD? Are there people in your life who don’t know about your IBD? Or even about IBD in general? If they do know a little bit, perhaps they have only heard rumors or untruths about a “bathroom” disease that is brought on by mental stress or a poor diet (both of which are untrue). It’s possible they see you come into work or school every day and are under the impression that everyday tasks are as easy for you as they are for everyone else (they’re not). Others may have heard of Crohn’s disease, but have no idea that ulcerative colitis and indeterminate colitis are also on the IBD disease spectrum, and can also be debilitating. World IBD Day is for everyone who is not living life with these diseases. World IBD Day is to raise awareness amongst the people who would help — if only they knew the impact IBD has on patients and caregivers. We cannot obtain the resources we need to fight stigma about IBD, improve access to care for patients, and raise funds needed for research, if society doesn’t know more about IBD. We cannot remove the roadblocks that are hindering physicians and patients from making cost-independent, shared treatment decisions until we shine a light on those obstacles. Important legislation won’t get implemented until we make our legislators aware of the needs of patients and caregivers. Have another idea? 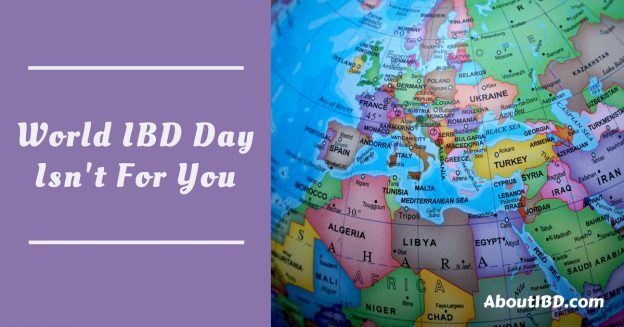 Doing something great to raise awareness on World IBD Day, or any day? Tell me about it on Facebook at https://www.facebook.com/aboutibd/ or on Twitter at https://twitter.com/aboutibd. This entry was posted in Advocacy and tagged advocacy, awareness, community, personal story, volunteer, world ibd day, writing on May 20, 2018 by Amber.